All of our DIY conservatory kits, are in a manner bespoke, as they are manufactured to your exact required dimensions and with the specifications you request. But In this context the term 'bespoke' refers to a conservatory that is not in the standard range ie: Edwardian, Lean-to etc. 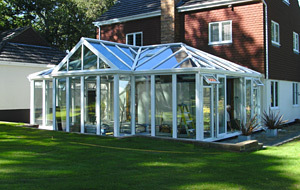 More often than not the bespoke conservatory design will be a combination of different styles. An example of which is the B-shape design, which consists of two Victorian models joined in the centre by a lean-to roof. Some examples of the variations on this design could be The Victorian model have five facets instead of three and the frontage of the lean-to could incorporate bi-fold doors. You may want to incorporate frame and roof colour options that are now available with a 'wood-grain' finish to the frames in colours like 'Chartwell Green' or 'Anthracite'. The aluminium clad roofs will then be powder coated to create an exact colour match. You can also upgrade the roof glazing to treated toughened glass, double glazed sealed units. There are a range of treatments from Low-E (U-value 1.4) to Celsius Elite (U-value 0.9) which anti-sun and anti-glare properties as well. When designing your self build conservatory let imagination free as there are very few designs we can't achieve.